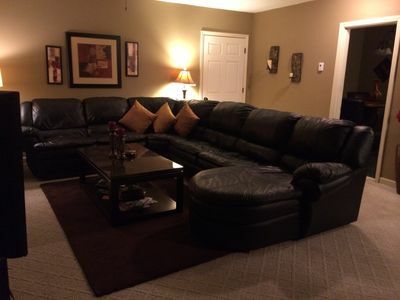 Pet friendly--close to Purina Farms, 35 min from Saint Louis. 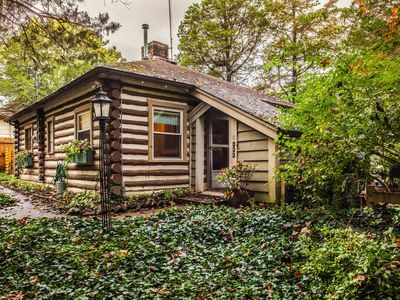 This charming 1950's Cedar Log Cabin is the perfect spot to get away from it all and still be able to enjoy the attractions of St Louis. 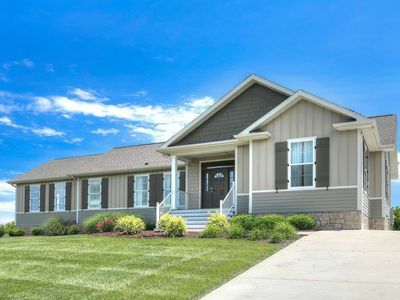 Beautiful drive through State Conservation Areas take you to a 20+ acre lake and this little country jewel. 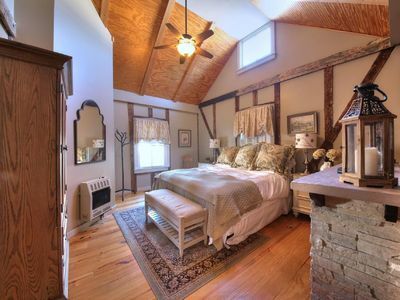 Darcie's little cabin has been referred to as "A Little Slice of Heaven" by many of her guests. All of the vintage treasures that you'll find throughout the cabin will help transport you to a simpler time when recreation and relaxation were a way of life. 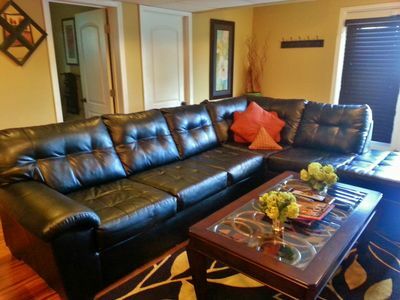 Great for small families who want to spend quality time together and get away from the hustle and bustle of life. Take the kayaks out on the lake or just hang out on the private dock and observe nature. Fishing poles are available if you want to fish for catfish, blue gill, crappy or small-mouth bass. 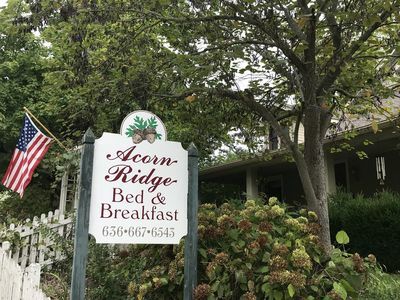 Also perfect for couples looking for a quiet, romantic get-away. 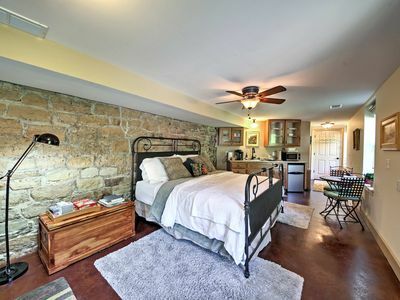 Very comfy queen bed with a view of the lake features soft linens and vintage quilts. You'll enjoy cooking together in the cute, vintage kitchen with the original sink and faucet. (Yes, it leaks a little, but that's part of the charm). You'll find everything you need to cook a delicious meal that you can enjoy on the picnic table overlooking the lake. Anything that you find in the stocked pantry is your's to use. Start a fire in the big stone fireplace. Firewood and all the fixings for S'mores are provided free of charge! There is also a fire pit out by the lake. It's fun to sit by the lake around a fire and listen to the big bull frogs! One of my favorite spots at the cabin is the front porch. You'll find two twin daybeds which are very comfortable. It's a great place to curl up with a book and look out over the lake. It is not heated or cooled, tho, so if you're using it for sleeping, you may feel a little warm in the summer or cold in the winter. 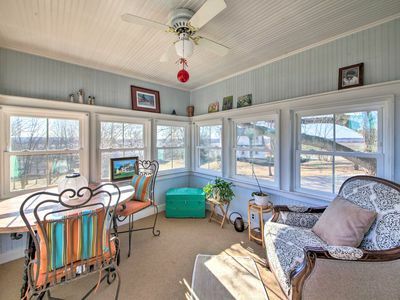 On this porch you'll find a corn hole game, life jackets (mostly kids sizes), fishing poles, and extra lawn chairs. At night, the living room can be transformed into your own private movie theater! A fabric screen can be lowered from the ceiling and the Epson Movie Mate projector will play DVDs (nice selection to choose from) or you can stream movies from the ROKU player. The Roku has a Netflix account and other types of programming for you to enjoy free of charge. There is also wifi so you can check email or browse the internet. You'll also find lots of board games and books and magazines to read as well as Lincoln Logs and Legos for the kids. My kids have generously donated the use of their Wii as well! There is a tv that can be hooked up to either the Wii or the Roku if you want to use it instead of the movie screen. I do not have cable tv, however, because I want to encourage my kids to turn the TV OFF. (Hint: sometimes I unhook the wifi too, and "pretend" that it's not working. If you do this, though, please remember to turn it back on before you leave). Another great convenience is the washer and dryer located in the kitchen area. There is also detergent provided. I'm happy to allow you to bring your pet as long as it's potty trained. There is a non-refundable pet fee of $50. 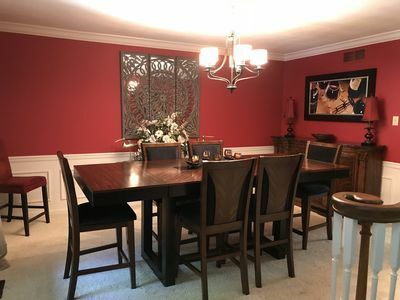 If you have a larger group, please check out our NEW listing called Lake Haven #1131503! 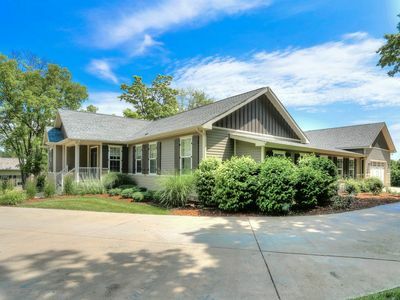 We just renovated a really charming, really cool vintage house across the lake from this one. 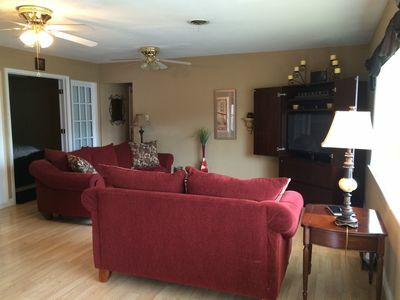 It is also pet-friendly and located on a large lot on the lake. 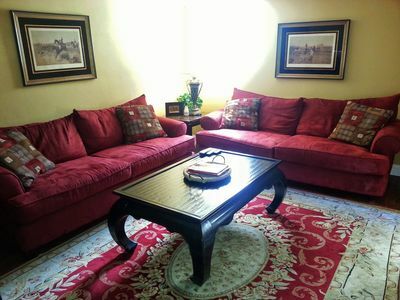 This property can easily accommodate up to 10 guests but it's charming and cozy enough to feel intimate if you only have a small group. 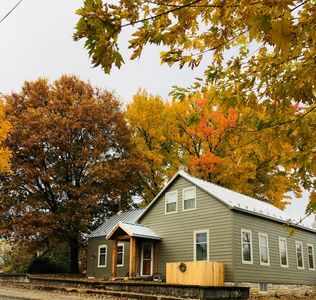 Adorable Two-Person Bungaloo nestled in the cozy town of Augusta, MO! 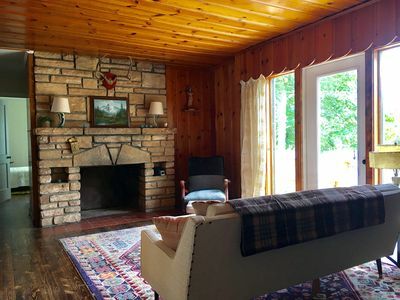 Lake Haven--Updated Mid Century Cabin Only 35 Mins From St Louis. 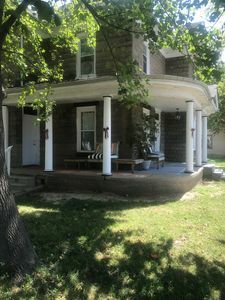 Historic home in Augusta, the heart of Missouri wine country!